This is the first of the two hard games to call. Both the Seahawks and the Falcon have looked great this year (the Seahawks didn’t start looking really good until the mid-to-late part of the season, but still). With Russell Wilson, Marshawn Lynch, an offensive line that has proven itself against some top tier teams, and a defense that has come out of nowhere, I would almost call Seattle a “complete team.” There is something that is holding me back from calling them that, but Seattle surely has a team they can brag about. On the other side, Matt Ryan, Michael Turner, Roddy White, Julio Jones, and Tony Gonzalez have an offense that looks nearly uncoverable. If a team goes man coverage on the receiving corps, they are going to get beat deep. If they back off to cover the receivers over the top, Turner will bruise his way at least four or five yards per carry. Atlanta’s defense is also pretty good. Another tough game to call. Green Bay has been a good team this year from start to finish. Had it not been for that bogus call in the notorious Monday Night game at the beginning of the season, they would have been in contention for the first round bye. And just to nip this right in the bud: no, Seahawks fans, there is no way that you could possibly construe any rules to make it a Golden Tate catch. Any self-respecting, rule-knowing football fan can understand what happened on that play. San Francisco has been consistently good as well. They even made a quarterback switch halfway through and have seemingly not missed a beat (until they played the ‘Hawks in that Week 16 game). In their last game, San Francisco beat Green Bay at Lambeau Field very well, 30-22. Now Green Bay has to travel to Candlestick Park to have a Week 1 rematch. They are both very able to score, Kaepernick is a dual threat quarterback and Aaron Rodgers is…well…Aaron Rodgers. I see Green Bay pulling this one out 34 – 21. The AFC is a little more cut and dry in terms of predictions. Baltimore has had a pretty good season. Unfortunately, key injuries to their defense has damaged their performance. While Ray Lewis looked good last week in his return, Terrell Suggs did not look good. Suggs claimed his Achilles was “acting up” during the win over Indianapolis. Expect a similar performance. Meanwhile, the potential MVP/Comback Player of the Year Peyton Manning has shown that he has felt no lag time in his recovery from that invasive neck surgery. Looking as good as ever, he has orchestrated an eleven game winning streak with the help of his ample run game and exceptional defense. Mile High is a hard place to play, and this isn’t Tim Tebow’s Broncos. Denver takes it 31-14. Another game that doesn’t have much to quarrel about. For three straight weeks, the Texans have looked unimpressive. After beating Indianapolis in impressive form, they got rolled by Minnesota 23-6, lost to Indianapolis 28-16 in an absolutely disgusting performance, and barely squeaked by a Bengals team that was only able to amass 198 yards by six points. To win this game, Houston is going to need either A) A brand new mentality or B) Divine intervention. 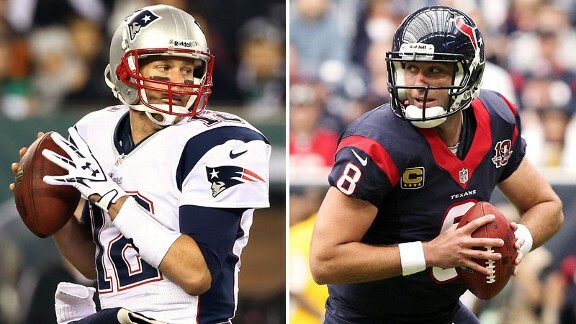 I’m calling a no contest here: New England 38, Houston 10. Look forward to next week’s looks. If I have it my way, it’ll be a ratings bonanza in both games with Peyton and Brady meeting up for the umpteenth time. Another ratings grabber will be Russell Wilson and company wanting to prove that the Monday Night win was not a fluke while Aaron Rodgers and crew will be looking for sweet, sweet revenge.